Amid mounting complaints from some Democratic quarters about the lack of attention paid to Republican John McCain on the first night of the Democratic National Convention, party leaders flowed forth to the podium inside the Pepsi Center Tuesday determined to draw sharp distinctions between the two candidates and deliver biting criticism of their fall opponent. Nobody delivered that message better and more effectively than New York Senator Hillary Rodham Clinton, the former Barack Obama adversary who in many ways has overshadowed events at this convention. Questions about party unity were at least momentarily put aside as Clinton took one final, shining turn in campaign 2008. "My friends, it is time to take back the country we love," Clinton said at the very beginning of her speech. "Whether you voted for me, or voted for Barack, the time is now to unite as a single party with a single purpose. We are on the same team, and none of us can sit on the sidelines." Clinton mixed unequivocal support for Obama with a blistering critique of the record of the Bush administration, tying McCain closely to the past four years. While she stayed away from personal criticism of McCain, whom she called a "friend," Clinton hammered away at his positions on the issues, delivering what's sure to become a signature line from the speech. "You haven't worked so hard over the last 18 months, or endured the last eight years, to suffer through more failed leadership. No way. No how. No McCain." For a politician who has been accused of staying cool to Obama's candidacy, Clinton had delegates in the hall super-heated Tuesday night. Significantly, Clinton was greeted with an uproarious ovation from Obama and Clinton supporters alike, one that went on for several minutes. 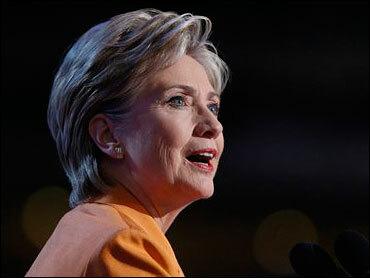 Aside from the nominee himself, Clinton's speech was the most widely-anticipated of the convention. After a sometimes divisive primary, one that continued to the bitter end, Obama and Clinton have struggled to show the party as a unified force. Comments made by Clinton and her husband over the course of the summer made many wonder whether the former first couple had come to grips with the primary defeat. Grumbling in the press from both sides about the healing process hasn't helped put those concerns to rest. In some ways, Clinton found herself in a possible no-win situation coming into her speech. Because of her long career in the political spotlight (and all the baggage that comes with it), Clinton's motives and words are finely parsed by political journalists and observers. "What does Hillary want" is not as easy a question to answer as it might seem. No matter what she says, there's certain to be criticism that it didn't go far enough towards embracing Obama or didn't send the right signal to her supporters. But critics and pundits will have to look hard to find any hairs to split from this speech. Clinton wasn't the only speaker to take up the attack on McCain. It was a night focused on the economy and the long line of speakers made certain to connect the Republican candidate to an administration which has gotten historically low marks on the economy. "George Bush has put the middle class in a hole and John McCain has a plan to keep digging that hole with George Bush's shovel," said Illinois Congressman Rahm Emanuel. In a fiery afternoon speech, Congressman Dennis Kucinich thundered, "If there was an Olympics for misleading, mismanaging and misappropriating, this administration would take the gold ... They want another four-year term to continue to alienate our allies, spend our children's inheritance and hollow out our economy." Kansas Governor Kathleen Sebelius poked fun at the number of houses McCain's wife owns, saying, "I'm sure you remember a girl from Kansas who said there's no place like home. Well, in John McCain's version, there's no place like home. And a home. And home. And home." And New York Gov. David Paterson said of McCain simply, "if he's the answer, then the question must be ridiculous." A similar challenge awaits the party on Wednesday night when former President Bill Clinton takes to the stage. There have been suggestions in recent days that of the two, he has been more resentful of the outcome of the primary campaign. But after the senator from New York's performance in Denver Tuesday night, it would take a lot to undo the good she did for her party.